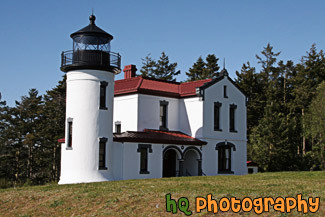 A scenic picture taken of the Whidbey Island Lighthouse located in Washington state on a sunny day. This lighthouse is called the Admiralty Head Lighthouse. This lighthouse has a breath-taking view of the Olympic mountains.